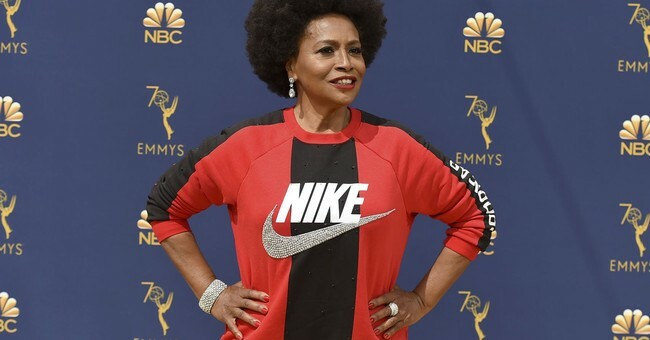 Jenifer Lewis, star of ABC’s “Black-ish” and Broadway, appeared at the Emmys Monday wearing a Nike sweatshirt in support of the company after they faced backlash for featuring NFL quarterback Colin Kaepernick as one of the faces of their brand. “I’m wearing Nike tonight to tell them how proud I am of them for supporting Colin Kaepernick and his protest against police brutality and racial injustice,” she explained in a red carpet interview. Colin Kaepernick sparked controversy two years ago when he began taking a knee during the national anthem to protest racial injustice and police brutality. An August NBC/WSJ found that a majority of Americans, 54 percent, believe that kneeling during the anthem is inappropriate. Lewis was not the only star at the Emmys to get political. In response to allegations that Supreme Court nominee Judge Brett Kavanaugh sexually assaulted a woman when they were in high school, “Glow” director Jesse Peretz’s wife, Sarah Sophie Flicker, wrote “Stop Kavanaugh” on her arm along with the phone number of the U.S. Senate.